Without a doubt, the Council of Trent is my favorite council. It was held for over 20 years and in various locations while utilizing various chronological methods. It decreed that seminaries be created so priest could be educated, decided what is Old and New Testament Biblical canon and Latin should be used in church services. An oddity of the council decrees is that the dating of the sessions changes from calends to month and day and back again, from Roman numerals and Arabic number usage and back again. It frequently states free passage to Protestants, but no one came. Even Huss ventured to the Council of Constance to be burned. It upholds the Latin Vulgate Bible, but states a new translation is needed. Below are selected events, according to accepted dating. At first reading, nothing seems out of place. The first "odd" item is Apostolici Regimiris where the doctrine of the Immortal soul is stated. It is odd because Plato is dated more than 1,500 years before the decree and the existence of the immortal was still not resolved in the Roman Church. It is difficult to image Christianity without a soul. The Papist version of Christianity at that time must have been strange. The listing of allowing pawnshops seems trivial, but it goes hand in hand with the immortal soul, purgatory and selling indulgences. No one is going to pay to have their dead relatives removed from purgatory, if these relative's souls no longer exist, that is, their souls are mortal and have died. The allowing of pawnshops allows to faithful to understand the similarity of getting their possessions "out of hoc" and getting their relatives out of purgatory. The "new" Saint Peters was in need of money for construction, so indulgences and purgatory were introduced. The allowance of pawnshops and the doctrine of the immortal soul overlap from May, 1515 to October, 1516, when Martin Luther placed his 95 theses on the church door. According to accepted chronology, 12 years after Luther finished his Bible, Trent declares what is canon for Roman Catholics. The Orthodox Church waited for over 120 years after Trent to declare what is the Orthodox position on the canon. The reasons I believe that the Council of Trent did not operate from 1545 to 1563 is twofold: (1) no Protestants came to state their beliefs even with multiple assurances of safe passage and (2) the various dating methods used. It is reasonable to conclude that the council was written in the early 1600's and back dated to the the 1550's. These sessions and their decrees would be circulating for 20 years before the Council of Jerusalem. Once the Greek Church learned of Roman Church's Bible Canon, the Orthodox responded. Waiting for 150 years to respond to Protestantism and Catholicism seems too long, although not impossible. Although waiting 1,600 years to state what is canon is an impossibly long wait to address what is and is not scripture. We return to Apostolici Regiminis to state two possible explanations for the late introduction of the dogma of the immortal soul. Rome possessed the Gospels and writings of Saint Paul. They did not see the hint of or support for the immortal soul in these writings, nor could they logically conclude the immortal soul from these writings, nor from the alleged writings of the Church Fathers, nor from the preceding 17 Ecumenical councils nor from Church Tradition. They could not deduce an immortal soul as the logical outcome of a Day of Judgment. Rome did not possess the Gospels and writings of Saint Paul. They had neither knowledge nor access to these authoritative writings, neither knowledge nor access to the alleged writings of the Church Fathers, neither knowledge nor access to any of the preceding 17 Ecumenical Councils, and finally, neither knowledge nor access to Church Tradition. If we accept the first premise, then the Western Church contained no men of ability or intellect. The greatest theologians of the Roman Church would not be competent to state what today all Christians know, that is, the immortality of the soul. The Roman Church, intellectually as a whole, must have been functionally illiterate. It is one thing for medieval monks to debate how many angels could dance on the head of a pin, but it is incredible to believe that the concept of the immortal soul was still being debated at this late date. It is little wonder why the Greek Church looked down on the Roman Church as uneducated simpletons. We now know the reason why the influx of refuges to the West from the fall of Constantinople brought about the rebirth of Civilization. The reason is these immigrants were able to read and write. If we accept the second premise as true, then Saint Paul's writings are to be dated after 1513, but before Erasmus's Textus Receptus of 1516. If at first reading this date seems uncomfortably late, the following examples are reprinted to understand the length of letters sent in the ancient world. The apostles and elders, your brothers,To the Gentile believers in Antioch, Syria and Cilicia:Greetings.We have heard that some went out from us without our authorization and disturbed you, troubling your minds by what they said. So we all agreed to choose some men and send them to you with our dear friends Barnabas and Paul— men who have risked their lives for the name of our Lord Jesus Christ. Therefore we are sending Judas and Silas to confirm by word of mouth what we are writing. It seemed good to the Holy Spirit and to us not to burden you with anything beyond the following requirements: You are to abstain from food sacrificed to idols, from blood, from the meat of strangled animals and from sexual immorality. You will do well to avoid these things.Farewell. Paul an Apostle, not of men, neither by man, but by Jesus Christ, to the brethren which are at Laodicea. Grace be to you, and peace, from God the Father and our Lord Jesus Christ.I thank Christ in every prayer of mine, that you may continue and persevere in good works, looking for that which is promised in the day of judgment.Do not be troubled by the vain speeches of anyone who perverts the truth, that they may draw you aside from the truth of the Gospel which I have preached.And now may God grant that my converts may attain to a perfect knowledge of the truth of the Gospel, be beneficent, and doing good works which accompany salvation.And now my bonds, which I suffer in Christ, are manifest, in which I rejoice and am glad. For I know that this shall turn to my salvation forever, which shall be through your prayer and the supply of the Holy Spirit.Whether I live or die, to me to live shall be a life to Christ, to die will be joy. And our Lord will grant us his mercy, that you may have the same love, and be like-minded. Wherefore, my beloved, as you have heard of the coming of the Lord, so think and act reverently, and it shall be to you life eternal;For it is God who is working in you; And do all things without sin. And what is best, my beloved; rejoice in the Lord Jesus Christ, and avoid all filthy lucre.Let all your requests by made known to God, and be steady in the doctrine of Christ.And whatever things are sound and true, and of good report, and chaste, and just, and lovely, these things do. Those things which you have heard and received, think on these things, and peace shall be with you.All the saints salute you.The grace of our Lord Jesus Christ be with your spirit. Amen.Cause this Epistle to be read to the Colossians, and the Epistle of the Colossians to be read among you. Letters sent in the ancient world were written on animal skins. Since these were expensive, compared to paper in later day Renaissance Europe, letters were short as demonstrated above. Later, when inexpensive paper was available, "letters" could afford to be longer. Saint Paul's Epistle to the Romans is a good example of length that was not economically possible before the introduction of paper for writing. For Saint Paul to have written all the Epistles and copies to made for various churches and individuals through the centuries, tens of thousands of parchments must have been used. This is not possible. 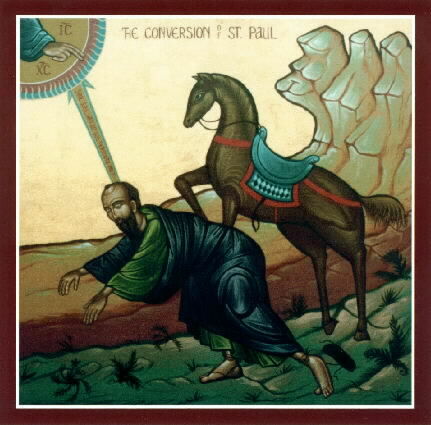 It does not take the skills of a specialized discipline to understand the quality of Saint Paul's writing, even in translation, compared, for example, to the Book of Revelation. Saint Paul does not habitually start his sentences with "and" which indicates that he was aware that this is an indication of poor writing. Not starting sentences with "and" is a modern convention. Revelation is not unreadable because of it, and few people would notice that one out of every eleven words is "and". Saint Paul's lengthy, by historical standards, "letters"
Saint Paul was aware of the modern convention of not starting sentences with "and"
We can confidently conclude from the accepted chronology that Saint Paul's writings date from between 1513 and 1516.